Ours is a simple request. 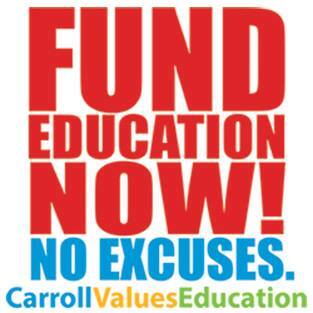 Our petition requests the commissioners meet the school system’s budget request. We would like everyone to print a copy and talk to a few friends to get their signatures. Take it to the soccer fields this weekend. Take it to the game. Visit your neighbors who don’t have school age children and probably don’t know anything about the funding of our schools. Take it wherever you’re going and use it to start conversations. So many people don’t have time to follow the budget process. They only find out when the cuts are announced. And if the budget request doesn’t get funded, there will be cuts announced next month. Let’s try to be proactive rather than reactive. We don’t know that the commissioners will take a petition seriously, but we do know that they are sensitive to hearing from lots of people. So the more conversations we have and the more signatures we can gather, the better. This is SO time sensitive! The commissioners have completed the meetings with all of the agencies and will begin deliberations next week, on Tuesday, April 12th. We would like to deliver the signed petitions the following week, April 19th. Gather signatures from family, friends, neighbors. If you can get more than ten signatures, print extra copies of page 2. Don’t forget to sign it yourself! We have an link to sign the petition online, but we encourage people to physically sign one if possible. Signed my petition and mailed it today. I strongly support this initiative. Education is the core resource that builds the future without it things fall apart. Education and teachers are needed as much as air and water to survive.